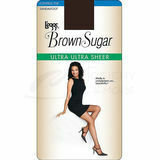 L'eggs Brown Sugar has a 100% so sheer nylon leg and is scarsely there. These hosiery feels soft as silk. Just a slight hint of color enhances your natural skintone. L'eggs Brown Sugar has a exceptional sheerness with a hint of color that improves your natural skin tone. 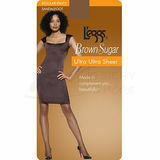 L'eggs Brown Sugar is the ultimate ultra-sheer hosiery, custom-made for women of color. These hosiery has a variety of styles, like pantyhose that is silky and sensational sheers. These hosiery also has a knee-hi's, features exceptional sheerness with a hint of color to accent your natural skin tone. A light and comfortable solution for today's more casual wardrobes. Look fabulous and gorgeous down to your legs.